Every item in the shop is carefully curated and a potential conversation piece. 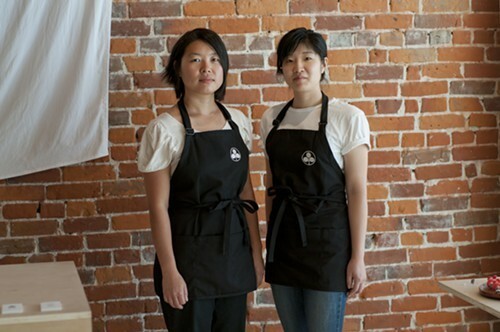 Every item reflects the impeccable taste of the owners, Kayoko Akabori and Yoko Kumano, who have turned a food and drink blog — and a shared passion for Japanese food culture — into a real-life brick-and-mortar shop at 815 Broadway in Old Oakland. So when Umami Mart, their store dedicated to Japanese barware and kitchenware, opened on August 4, there was good reason for Bay Area cocktail mavens and Japanese foodstuffs enthusiasts to rejoice. Kayoko Akabori (left) and Yoko Kumano. The genesis of the store dates back to 2007, when Akabori started Umamimart, a food and drink blog with an international scope and a particular emphasis on Japan. Akabori was living in Brooklyn at the time, and she assembled a crack team of writers basically by asking her food-focused friends to contribute content (for free). Kumano would file stories from Tokyo; others would write from New York, the Bay Area, Copenhagen, and beyond. “It just grew into this community,” Akabori explained. By 2010, Akabori and Kumano — who both grew up in Cupertino — had moved back the Bay Area and started selling a handful of items online: a cocktail glass, a custom-designed Umamimart travel mug, and so forth. Eventually, they started thinking it would be nice to have a brick-and-mortar store of their own, or at least a warehouse — in part just to have a place to put the inventory that was piling up in Kumano’s house. 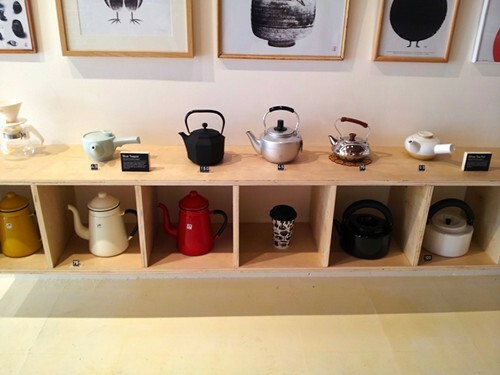 A display of teapots at Umami Mart. After a couple of successful pop-up events, Akabori and Kumano met Alfonso Dominguez, co-founder of Popuphood, the urban renewal experiment that has filled empty storefronts in a small section of Old Oakland by negotiating six months of free rent for promising local businesses. If things go well, the fledgling retail enterprises can then negotiate a long-term lease when the six months are up. It’s an ambitious concept — part business incubator, part neighborhood revitalization project. And when Dominguez offered Akabori and Kumano one of the Popuphood spaces that had opened up, they almost felt it was too good to be true. Before Umami Mart, Akabori was a bartender at Oakland’s Camino, and Kumano worked for Takara, the sake brewery in Berkeley. Both quit their jobs and went “all in” on getting their new retail store off the ground. Within a couple of months (and a lot of help from architect friends and woodworker friends), the shop was ready to open. You can’t really talk about Umami Mart without talking about the beautiful space that Kumano and Akabori have created, thanks in large part to the design work of their friend (and Umamimart blog contributor) Anders Arhoøj, a Danish art director. Arhoøj conceived of the space as a sort of cross between Scandinavian minimalism and a Shinto-inspired aesthetic, so the overall look is very clean and spare. There’s a lot of birch plywood and a lot of open spaces — the products on display aren’t jam-packed. Then there are little touches that are very Japanese, rooted in Shinto spiritualism: white noren (traditional Japanese curtains) in all the windows, hamaya arrows mounted on the wall to ward off evil spirits, and a large shelf in the middle of the store that’s meant to function as a kind of shrine. 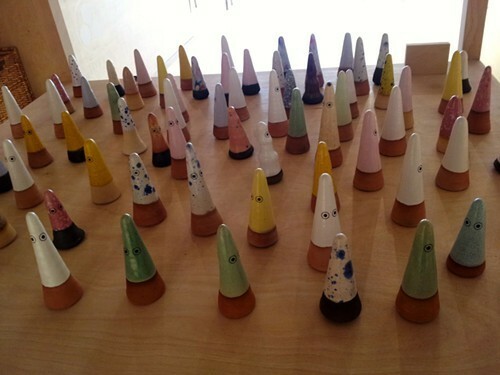 "Ghosts" — ceramic talismen for the kitchen — on display at Umami Mart. If you wanted to put on a very minimalist staging of a play that takes place in feudal Japan, the set might look something like Umami Mart. The store has the understated elegance that’s beloved by interior design bloggers, and shopping there can feel a little bit like strolling through an art gallery. Everything is arranged just so, and there are little plywood blocks on which product descriptions are typed in a museum-worthy font. But Akabori stressed that the last thing she wants is for people to feel like the shop is overly precious or stuffy — too much like a museum or gallery. She said she and Kumano want customers to pick things up to look at them and, above all, to ask questions. One of her favorite items that they sell is a red plastic gadget with a twirly handle, a bit like a rotary cheese grater. It’s a sesame seed grinder, Akabori explained — the “quintessential Japanese kitchen tool.” I didn’t know what it was, and apparently everyone who visits the store picks it up and asks about it. “It’s so great because then I get to explain it,” Akabori said. Most of the items in the store are Japanese imports, and many of the kitchen gadgets, in particular, are unfamiliar to American home cooks — but for Akabori and Kumano, they’re just things they grew up with. "There's a functionality behind everything that we can stand behind,” Akabori explained. “These things aren't just pretty; they're easy to use." Products at Umami Mart also aren’t as expensive as you might expect at a store that looks like a gallery. Yes, there are high-end luxury items, but there are also plenty of things you can pick up for less than twenty bucks — the sesame seed grater, for instance, is only $7. Akabori and Kumano also hope to sponsor a variety of food-and-drink-related events at Umami Mart — to use the space as a real community gathering place. So, for instance, a couple of weeks ago, they hosted a macaron night featuring the homemade confections of a visiting baking whiz and Umamimart blogger. And this Thursday, August 30, from 6 p.m. to 8 p.m., Umami Mart will host a sake tasting, during which several kinds of sake (ginjo, nama, junmai) will be served at different temperatures. The event is free, but you should RSVP to hello@umamimart.com if you plan to attend. More than anything, Akabori says she hopes the shop will eventually foster the same sense of community — among food lovers and booze connoisseurs and Japanophiles — that she was able to develop on her blog. "That's the kind of atmosphere that we want to encourage," Akabori concluded. These edibles (and drinkables) are all made in the East Bay. Most seaweed consumed here is imported from farms in Asia. Salt Point Seaweed aims to change that.